The journey to work for millions of commuters across the UK has been improved thanks to free Wi-Fi having been installed on buses and trams as part of the Government’s SuperConnected cities initiative. More than three million unique users are making regular use of the service, using the freely available Wi-Fi to grab the latest news headlines, check the weather, browse the Internet, send emails and use social media on their daily commute. 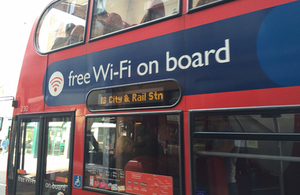 Hundreds of buses, trams and trains in nine cities across the UK (Leeds, Bradford, Oxford, Manchester, Salford, York, Edinburgh, Cardiff and Newport) have been equipped with free public Wi-Fi. The latest usage figures highlight the scheme’s popularity. The rollout of free Wi-Fi on public transport has been a tremendous success and I’m delighted that so many people are making use of it. Installing free Wi-Fi on public transport is one of the ways we’re boosting connectivity across our cities and making sure the UK is properly equipped to meet the increasing demands of the digital age. As well as providing free public Wi-Fi on public transport, the Superconnected Cities programme saw free public Wi-Fi installed in more than 1,000 buildings in 22 cities across the UK. The programme was designed to help cities develop the digital infrastructure they to remain internationally competitive and attractive places to invest, visit and do business.